Comet Hale Bopp was discovered on July 23, 1995 and one of the brightest seen for many decades. It was visible to the naked eye for a record 18 months, twice as long as the previous record holder, the Great Comet of 1811. Hale–Bopp met or exceeded most predictions when it passed perihelion on April 1, 1997. The comet's dust tail roughly followed the path of the comet's orbit and yielded no danger for Earth. Comet ISON is different. This comet follows the path of the Great Comet of 1811. 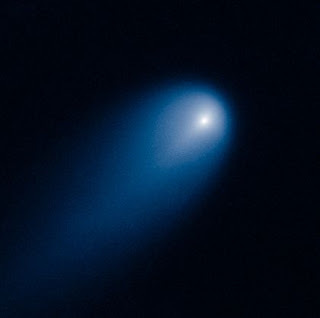 This comet, according to NASA will overrule the brightness of Hale Bopp, later this year. OK, ISON will not be a threat to Earth - getting no closer to Earth than about 40 million miles, but a new model of the debris flowing from Comet ISON suggests that the sungrazer could dust the Earth around January 12, 2014. The Solar Cycle according to NASA peaks in the second half of 2013, and possible last in 2014. End of this year, early 2014, in the same time frame: Comet ISON and the peak of the Solar Cycle! Listen to a revealing interview of Ed Dames on TheLightOfDayRadioShow where Ed Dames expressed his concerns about comet ISON.